This is the second year of Marvy Moms Black Friday Sales on All the Crunchy Things. This is your chance to shop from your comfort of your home or wherever you happen to be with your mobile device. This post will be updated with new sales as I find them so be sure to keep coming back for more! I will be crossing out sales as they expire and adding new ones as I find them. 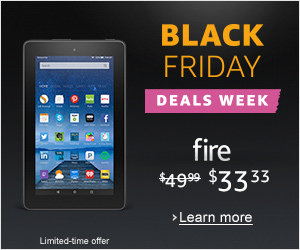 Is a Kindle Fire crunchy? It is if you put all your Kindle books on it instead of buying the paper equivalents! These are just $33.33 on Black Friday. I bought two of these last year when they ran a similar deal and got a case for each of them. I have one of the original Kindle Fires and paid $199 for it a few Christmases ago. Be sure to pay attention to the ship date to make sure you get it in time (or maybe you don’t care) for the holidays. Last year they were backordered and shipped a bit past Christmas. My favorite Amazon deal of the year! Get $10 off your $25 purchase of a printed book. To use this promotion, you must enter HOLIDAYBOOK at checkout under the “Gift cards & promotional codes” section to receive $10 off any books purchase of $25 or more. Offer ends November 28, 2016 at 02:59am EST. Essential Oil Safety: A Guide for Health Care Professionals-, 2e by Robert Tisserand and Rodney Young: Current price for the hardcover edition is only $57.73 (down from $99.95). With the coupon, you’ll pay less than $50! Get your next book at Amazon for $10 off! Until November 30th, Amrita Aromatherapy is giving all retail customers a 50% discount on all items except for one book by Salvatore Battaglia (great book by the way!). Free shipping on orders over $50 (before sale price)! This is the official store of the American College of Healthcare Sciences and anyone can purchase products from this site. I got some great deals on books here last Black Friday and I’m excited to see that they have a sale again! Get 50% off select items on Black Friday 11/25/16. Another essential oil company! Get 25% Sitewide Savings (excludes aromatherapy kits and gift cards). Use coupon code BF2016 at checkout to get the deal. They also carry musical instruments! This deal is good for Black Friday only. They are also offering Free Shipping on orders over $49.99 through the end of the year. Teri Leigh Baird is a certified aromatherapist and the genius behind the soaps and other aromatherapy products at Aroma Treats. My friend and fellow aromatherapist, Robin Kessler, uses Teri’s soap and says, “Her soaps are wonderful, makes my face feel soft and smooth. 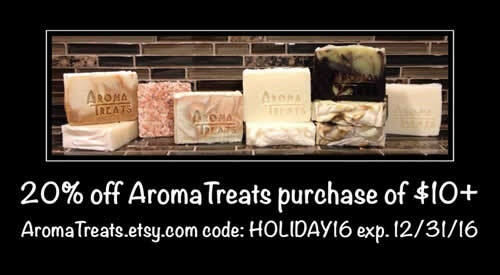 The soap is huge and lasts a very long time.” On Black Friday only, get 20% off your Aroma Treats purchase of $10 or more. Get Free Shipping Thursday thru Sunday, using code SHIP16. Plus several receive 9-36% off select products. Get a 15% discount through Monday 11/28/16. Use promotion code: pumpkin (all lower case) in the Payment Details section of checkout. Get 30% off any one item of your choice with code BNFRIDAY16 (some restrictions apply). Offer good through 11/27/16. In addition, you can also use the code to buy one additional book in the store. Plus, spend $25 and get free shipping. What aromatherapy, homeopathy, or herbal medicine book will you buy? 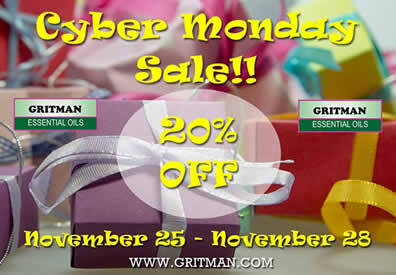 All oils 15% off (Sizes 1 oz and smaller) on Cyber Monday only. Shipping is free on orders over $49. Gritman is offering 20% off everything in the store (except classes). Don’t let the name of the sale fool you! Sale runs Friday 11/25 to Monday 11/28/16. I really don’t know anything about their essential oils, but I did buy elderberries from them once when everyone else was out of stock. They are offering 20% off your entire order the week of Thanksgiving with code 1611 at checkout. Black Friday is the Fourth Friday of November. Free Ship Friday.. use the discount code Friday-Free and receive free domestic shipping on orders over $75. Thanksgiving weekend… From Thursday through Sunday, use the discount code Gratitude and save 10% on all our retail sized products. Bulk products, our imported books, and our kits are not included in this sale. 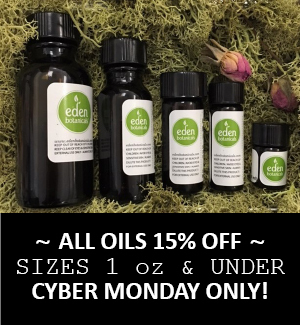 Cyber Monday… Use the discount code CYBER and finish off your holiday shopping by saving from 12 to 18% on all retail-sized essential oils, absolutes, and CO2 extracts. Everything listed here is included. Choose 20% off your order (20%OFF) OR Free Shipping (FREESHIPPING) all day Black Friday. Handmade natural and essential oil products from aromatherapist, Shannon Becker. Use code BF16 at checkout for 10% off your order on Black Friday. Shannon is also available to create custom blends for specific needs. 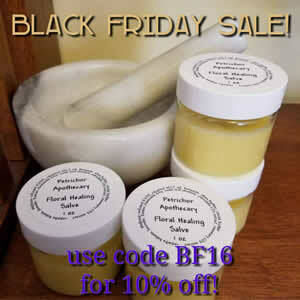 Get the deal from Petrichor Apothecary! Pompeii Organics has a nice selection of essential oils, hydrosols, and aromatherapy accessories. 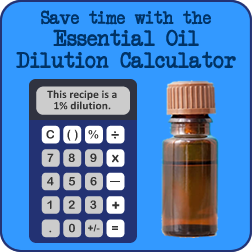 Many of their oils are organic and all have GC/MS reports available right in the product descriptions on the website. Get 15% off all weekend with coupon code: shopsmall2016. Free shipping on orders over $75. For a limited time, my good friend and fellow aromatherapist, Robin Kessler, is waiving her consultation fee! Get a customized aromatherapy product for only the cost of the product. 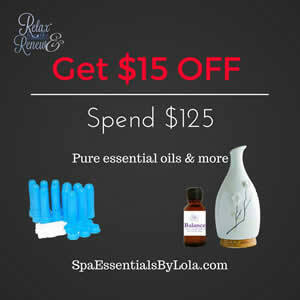 This is a super deal as Robin is an amazing aromatherapist! Fill out a client intake form by Monday 11/28/16 to get the deal and Robin will be in touch soon! Daily Specials will be revealed each day. Free shipping day for orders over $80! Just enter: FREESHIP Please note, no other discounts can be used with this code. 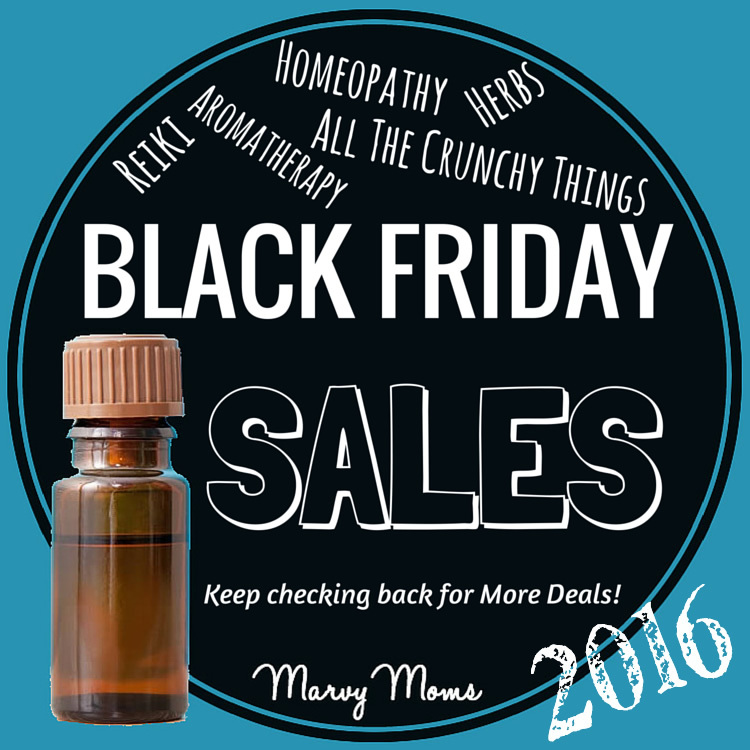 20% discount on all our essential oils on Black Friday with the code: BlackFriday20. Please note, no other discounts or free shipping codes can be used with this discount. Lots to order from this site, including essential oils from the French company, Florihana. Check their website for deals on certain products, including buy one get one specials on Gold Label Virgin Coconut Oil, Virgin Coconut Oil Moisturizing Lotions, Canadian Raw Honey, Maple Syrup, and Gold Label Virgin Coconut Oil for Hair Treatment. Offer good until midnight EST November 27th. This is a great online used bookstore and I’ve bought some great homeopathy and herbal medicine books from them. Shipping within the United States is always free for orders over $10. And until November 30th you can save 20% off three or more books with code THANKS2016. Last year I wrote about my experience with Reiki Level I, II and Master Certification at Udemy, which is available for only $15 during the Black Friday sale. 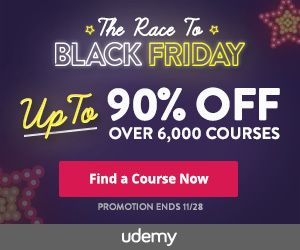 All Udemy courses are discounted for Black Friday and you’re sure to find something you like. Get 20% off your entire order (discount shown in shopping cart) plus Free Shipping for orders over $35. All single homeopathic remedies are 15% off for the month of November. No coupon code is needed and discount is applied in the shopping cart. Wingsets is owned by Ann McIntire Wooledge who is a nurse, aromatherapist, and soap maker. Fabulous aromatherapy blends, oils, soaps, and more! Get 10% off your entire order throughout Black Friday with the code BlackFriday2016.